Access to the MAPCO website has been sparodic during January and Februray 2014, due to bandwidth issues resulting from the increased visitor traffic load over the past year. MAPCO has essentially become a victim of its own success. This problem has recently been resolved, and it is not anticipated that there will be further access problems for the site. MAPCO wishes to thank all visitors and supporters for your continuing interest in the site. It is greatly appreciated! Thank you. In other news, during 2013 MAPCO relocated to much larger premises. At present all items are still in storage boxes, and the office is in a state of chaos. We currently have no scanning setup, so there will be no new maps scanned for display in the immediate future. We are hoping to have this resolved soon, and have everything in operation again within the next few months. In taking stock of our current situation we have discovered quite a backlog of scanned items that have never made it to the top of the list for display. We will try to trawl through the scanning archives to find and display a few treasures that have not previously seen the light of day, and example of which is shown to to the left. Enjoy! Sketch Map - Adelaide, South Australia, 1913. 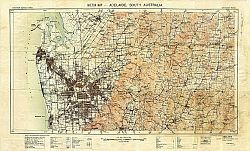 A high resolution scan of an 1913 map of Adelaide, South Australia, is now on display. This map has been fully indexed and is searchable via a search engine. This map was produced as part of the Commonwealth military survey of Australia (1914-1964), which commenced just prior to World War I. We hope that you find this map of interest. 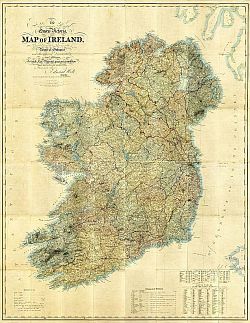 A highly detailed, high resolution scan of an 1838 map of Ireland is now on display. 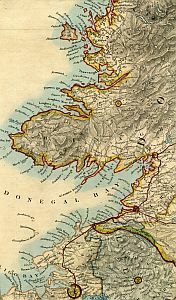 To Her most gracious Majesty Queen Victoria, This Map of Ireland, Compiled from the Surveys of the Board of Ordnance and other approved Documents By J. & C. Walker, Is with Her Majesty's gracious permission Most Respectfully Dedicated. By Her devoted Subject Edward Holt, Proprietor. By whom it was purchased from the Assignees of WILLIAM COLLING HOBSON. Published by the Proprietor Edward Holt, Hanover Street, Liverpool, 1st June 1838. Sold by J. & C. Walker, 9 Castle Street, Holborn, London. This massive hand coloured map measures 154cm x 124cm, and has been dissected and mounted on linen. Enjoy this extremely rare and beautiful map! 1915 Map of Adelaide, South Australia. Sketch Map. Adelaide, South Australia. Commonwealth Department of Defence. Scale 1 Inch : 1 Mile. 1923 Map of the United States of America. Department of the Interior, Hubert Work, Secretary. General Land Office, William Spry, Commissioner. United States Including Territories And Insular Possessions Showing The Extent Of Public Surveys, National Parks And Monuments, Indian, Military, Bird and Game Reservations, National Forests, Railroads, Canals And Other Details. Scale: 1 Inch : 37 Miles. 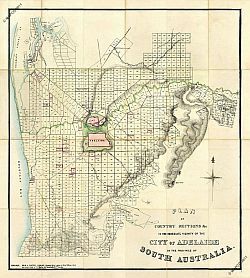 A Plan Of Country Sections &c In The Immediate Vicinity Of The City Of Adelaide In The Province Of South Australia is now online. This map was originally sold at Platts's Library, Hindley Street, Adelaide (corner of King William Street), and was also available for purchase in London from J.C. Hailes, 104 Leadenhall Street. I hope that you enjoy this beautiful, rare map! Engraver: T.A. Dean, after Henry William Pickersgill. Source: Frontispiece portrait from "Outlines Of The World", by A. Arrowsmith, Geographer To His Majesty. This portrait of Aaron Arrowsmith senior was published by his son, also Aaron Arrowsmith, in an atlas containing 45 maps of the world. The atlas contains a dedication to the Rev. Dr. Stainer Clarke, F.R.S., by Aaron Arrowsmith junior, Soho Square, January 1825. This is one for the map collectors! Enjoy. Sara Douglass died this morning at around 5am. Sara loved old maps, especially maps of London. Many key scenes in her books occurred in London, and we spent hours researching locations to ensure historical accuracy in her writing. St Dunstan's-in-the-East, and the crypt of St Thomas' under London Bridge, are two examples. Fans will know. Both self confessed map nerds, we developed our map separate websites together back in early 2006. We learnt a lot from each other as we constructed the sites, and had a lot of fun together. Sara's web time was eventually taken over by her passion for her house and garden, which she loved to share on her Nonsuch Kitchen Gardens website. This is the forum on which she openly spoke of her battle with cancer, and through which people from all over the world offered her friendship and support. Sara will be deeply missed. A Plan Of Country Sections &c In The Immediate Vicinity Of The City Of Adelaide In The Province Of South Australia c1849 will soon be displayed. The map has been fully scanned, and work is currently under way preparing the images for display some time in September. Edward Stanford, 6 & 7 Charing Cross, S.W. 6 Inches to 1 Eng. Statute Mile; or, 1 Inch to 880 Feet; or, as 1:10560 on the Ground. This is the third of MAPCO's copies of Stanford's Library Map of London to be displayed. MAPCO's edition of this map from 1897 will be on display in 2011. A Geological Map Of England, Wales, And Part Of Scotland, Showing Also The Inland Navigation By Means Of Rivers And Canals, With Their Elevation In Feet Above The Sea, Together With The Rail Roads & Principal Roads, By J. & C. Walker. c1836 has just been displayed. 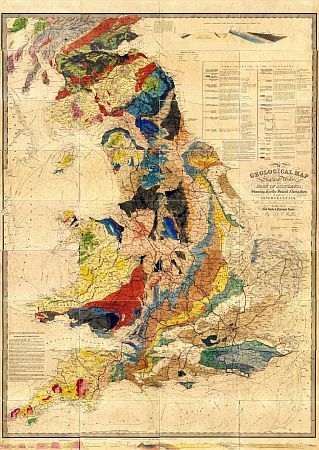 I hope that you enjoy this significant early geological map. Stanford's Map Of London Showing The Boundaries Of Parishes, Ecclesiastical Districts, And Poor Law Divisions 1877 (offline since 16 October 2010). Look out for more MAPCO maps throughout 2011! 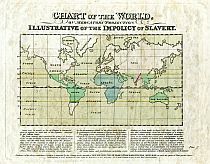 Chart Of The World, On Mercator's Projection, Illustrative Of The Impolicy Of Slavery c1824 is now on display. Hand coloured engraved paper map of the World, sold by Joseph Cross for the price of 3d. The map shows the extent 30� north and south of the Equator in which sugar is grown. Australia is still shown as New Holland. An unusual little map that would have been the talking point of late-Georgian London. The primary argument of the author made here against the slave trade is based on the economic burden to the British population in paying duties to support the production of "Slave grown Sugar". This argument was commonly used at the time, in conjunction with contempt for the degrading treatment of slaves kept as property by white masters, to argue the case for the abolition of slavery. Darton's New Plan Of The Cities Of London & Westminster, & Borough Of Southwark, 1817 is now on display. This map of London has been extended east by an extra sheet 17cm (6¾") wide, extending the map from Stepney as far east as Greenwich Marsh. This is a highly decorative map, although it has some offsetting (transfer of the image from one part of the map to the other due to folding). The map illustrates proposals for the "Intended Markets" on the eastern side of Regent's Park (which became the Cumberland & Clarence Markets), the Intended Docks east of London Docks, and many other proposed improvements. It also has nice detail of Kensington Gardens. The enlarged map images afford vastly improved navigation and viewing. Enjoy! Look out for more MAPCO Revised maps in 2011! I just wanted to take this opportunity to thank you for your support throughout 2010, and to wish you all the very best for a Merry Christmas and Happy New Year! I look forward to providing you with more high quality online maps in 2011. Below is a summary of new maps and updates from 2010. Do take a look at what has been achieved throughout the year. 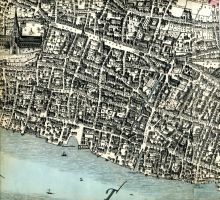 It has been a very London-centric year, with 29 new London maps displayed, and a further 3 London maps already on display being completely revised and improved. Do take a look at these, and at all of the other wonderful 2010 additions to the site. Enjoy this summary. There are better things to come in 2011! The Village Of Charing, &c: From Radulphus Aggas's Map, Taken In The Reign Of Queen Elizabeth, 1578. Parts of the Strand and Covent Garden, as they appeared in the reign of Queen Elizabeth. Plan Of Part Of The City Of Westminster, Copied From Radulphus Aggas's Map, Taken In The Reign Of Queen Elizabeth, 1578. Plan Of Westminster; From Norden's Survey, Taken In Queen Elizabeth's Reign, 1593. Part of Visscher's Panoramic View of London, 1616. Sir John Evelyn's Plan For Rebuilding The City Of London After The Great Fire In 1666. Sir Christopher Wren's Plan For Rebuilding The City Of London After The Dreadfull Conflagration In 1666. Plan of Arundel and Essex Houses 1677. Plan of Bedford House, Covent Garden, &c. Taken About 1690. Site Of The Buildings Which Once Covered The Southern Half Of Deans Yard 1734. A Map of the New Roads &c. from Westminster Bridge 1753. Aldersgate Ward with its Divisions into Precincts and Parishes And the Liberty of St. Martins le Grand, According to a New Survey 1772. Aldgate Ward with its Divisions into Precincts and Parishes According to a New Survey 1772. A New and Accurate Plan of Billingsgate Ward, and Bridge Ward Within, Divided into Parishes from a late Survey 1772. Bishops Gate Ward Within And Without According To A New Survey 1772. Breadstreet Ward And Cordwainers Ward With Their Divisions Into Parishes According To A New Survey 1772. The Wards Of Coleman Street, And Bassishaw, Taken From The latest Survey, With Corrections And Amendments 1772. Farringdon Ward Without, With Its Divisions Into Parishes, From A Late Survey 1772. David Hughson's Walk 13th, 1817. David Hughson's Walk 15th, 1817. Pigot & Co.'s New Map Of England & Wales, With Part Of Scotland 1840. 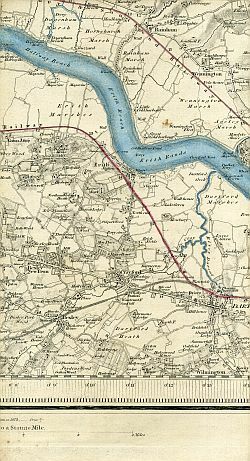 Including The New Lines Of Canals, Rail Roads, &c.
Map Of The County Of Surrey From Trigonometrical Survey With The Roads, Parks & Railways, By James Wyld, Geographer To The Queen, 1874. A Plan Of The Great Fire In Bishopsgate Street Leadenhall Street & Cornhill &c. On Thursday Novr 7th 1765. Cross's General Map Of Australia 1836 is now on display. This map was published by Joseph Cross of 18 Holborn Hill. This is the oldest Cross map in the MAPCO collection. Pigot & Co.'s New Map Of England & Wales, With Part Of Scotland 1840. Including The New Lines Of Canals, Rail Roads, &c. has just been displayed. I hope that you enjoy this pretty little Pigot map. Stanford�s Library Map Of London And Its Suburbs 1864; Showing All The Proposed Metropolitan Railways and Improvements. Enjoy this unique, high quality map of London. MAPCO has just taken delivery of a brand new large scanner. This was purchased specifically to enable scanning of Bacon's Large Scale Ordnance Survey Of London And Suburbs c1880. The scanner was quickly installed onto the computer, and a page of the Bacon Atlas placed onto the scanner bed. The page was scanned without reading any instructions. Take a look at the result and judge for yourself. I have had to optimize the image for the web to reduce the file size, but I'm happy with the result, and anticipate that images will eventually look much better with practice. I look forward to being able to display this map in 2011. 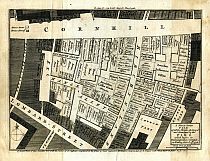 A New & Correct Plan Of All The Houses Destroyed And Damaged By The Fire Which Began In Exchange-Alley, Cornhill, On Friday, March 25th, 1748. Both of these maps include extensive notes taken from the London Magazine and Gentleman's Magazine of the time, including the names of occupants in the area, and notes on some of those killed during the fires. A Plan of the City and Liberties of London, Shewing the Extent of the Dreadful Conflagration in the Year 1666. There is a compelling link between these three London fire maps. It is fascinating to contemplate just how close London may have come to repeated total catastrophe in 1748 and 1765. I hope that you find these items of great historical, and hopefully for some, genealogical, interest. Kelly & Co.'s map of London 1857: Drawn & Engraved Expressly For The Post Office Directory is now on display. Title: London 1857. Drawn & Engraved Expressly For The Post Office Directory. Cover Title: Post Office Directory Map Of London With Patent Index. Index Title: A New Map Of London, Copied By Permission, From The "Post Office London Directory", With Patent Index, Enabling Any Place To Be Found On The Map With Mathematical Certainty. Price: Two Shillings Plain ; Three Shillings Coloured. Showing The New Postal Districts. This hand coloured map is highly detailed, and is the earliest example of a Tape Indicator Map that MAPCO has ever come across. I hope that you enjoy this beautiful, rare map. 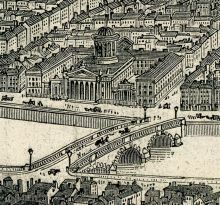 A panoramic view of Edinburgh from 1848 will be displayed on the MAPCO website in 2011. Title: Panorama of Edinburgh. Illustrated London News. Sheet Size: 1040mm x 460mm (41" x 18"). Image Size: 915mm x 318mm (36" x 12½"). Published with the Illustrated London News, Saturday, 8 July 1848. This highly detailed birds-eye view of Edinburgh from Carlton Hill includes a Key to the Panorama, with principal buildings and features numbered and named. This balloon view of Edinburgh will be on display in 2011. Wallis's Plan Of The Cities Of London And Westminster 1804 is now on display. 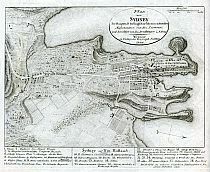 A later version of Wallis's 1801 map, this edition is extended east by an extra sheet 11¾" (30.0cm) wide, from Stepney to Greenwich Marsh. An additional title "The Isle Of Dogs and the New Docks for the West India Trade" is displayed in an oval at the top left. However, the map is still part of the MAPCO collection and the MAPCO : Map And Plan Collection Online website. Look out for more MAPCO Revised maps in coming months. Smith's New Map Of London c1828 has been updated as part of the MAPCO Revised project. The enlarged map images make navigation and viewing much simpler than the original display format from 2006. I hope that you find the updated map useful. Look out for more MAPCO Revised maps in coming months! 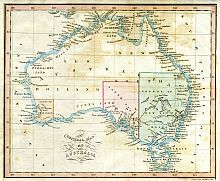 A map entitled Plan von Sydney der Hauptstadt der Englischen Colonien in Australien. Aufgenommen von Hrn. Lesueur; und berichtigt von Hrn Boullanger i. J. 1802 (Map of Sydney, the capital of the British colonies in Australia. Recorded by Mr. Lesueur, and corrected by Mr Boullanger AD 1802) is now on display. This rare, early map of Sydney records details of roads, buildings, windmills, gardens, orchards, gallows, brickfields, and the cemetery. Topographic relief is represented by hachures (shading lines). A Key to important buildings and places is located below the map. All text is in German. I hope that you find this map of interest. Enjoy! Cross's London Guide 1844 has been displayed. This is the fourth of 5 Cross maps in the MAPCO collection to be displayed. This map was scanned way back in 2007, but has only now made it onto the site. Cross's London Guide 1844 nicely fills the 1840s gap in displayed maps. I hope that you find this map of use. Enjoy! 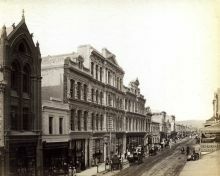 A preview page displaying the first of many Old Adelaide Photos has just been displayed at adelaidephotos.com.au. The preview page includes a very high quality enlargement of this image (3200 pixels wide x 2560 pixels high). Enjoy this wonderful preview image! A preview page of London, Westminster And Southwark As In The Olden Times Shewing The City And Its Suburbs With The Churches, Monasteries, And All The Important Buildings As They Stood In The Reign Of Henry VIII Before The Reformation has just been displayed. This pictorial map is highly detailed, and the preview page includes an huge enlarged view. The London Maps pages has been revised, and is now presented in a new format. Some of these maps include extremely high quality enlarged views, with file sizes up to 6.7MB. A Map Of The County Of Surrey From Trigonometrical Survey With The Roads, Parks & Railways, By James Wyld, Geographer To The Queen, 1874, has just been displayed. This map includes a comprehensive search engine, designed to search for results within the Surrey map pages only. Use the "Search This Map" function at the top of each page to search for place names in Wyld's 1874 map of Surrey. The search feature is a fabulous addition to this wonderful map. My sincere thanks go to all who participated in this transcription project. Sincerely, thank you! Enjoy this beautiful map of Surrey! A preview page of Collins' Railway Map Of Essex c1860, published by Edward Stanford, 6 Charing Cross, S.W., has just been displayed. This map will be fully scanned and displayed in 2010, hopefully with a fully indexed Place Name Search Engine. A series of 1901 Census maps will soon be displayed on the MAPCO website. The maps planned for display are of the 1901 Census Registration Districts for London, and the Counties of Middlesex, Essex, Surrey and Kent. Look out for these maps and more in 2010/11! Being No. 1 Of A Series Of Views Of The Principal Capitals In Europe. Presented Gratis To The Subscribers To The Illustrated London News. Supplement to the Illustrated London News. For The Week Ending Saturday, June 6, 1846. This highly detailed birds-eye view of Dublin includes a Key to the Panorama, with principal buildings and features numbered and named. This balloon view of Dublin will be on display soon. 1 May 2013 Sketch Map of Adelaide, South Australia, 1913 displayed. 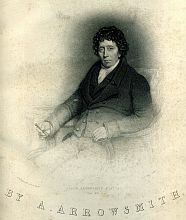 Engraved Portrait of Aaron Arowsmith (1750-1823) displayed. 28 February 2011 MAPCO Revised: The Topographical Survey Map Of The Borough Of St. Marylebone 1834 updated and improved, with enlarged images. 19 February 2011 MAPCO transfers from archivemaps.com >>> mapco.net. However, archivemaps.com remains operational. 10 February 2011 Walker's Geological Map Of England, Wales, And Part Of Scotland c1836 displayed. 31 December 2010 Plan des Villes de Londres et de Westminster et de leurs Faubourgs avec le Bourg de Southwark, 1700 displayed. Plan Of The Proposed Docks And The Line Of A Canal With A Collateral Cut On The Surrey Side Of The River Thames 1799 displayed. 30 December 2010 Stanford's Map Of London Showing The Boundaries Of Parishes, Ecclesiastical Districts, And Poor Law Divisions 1877 back on display (offline since 16 October 2010). MAPCO Revised: Cross's New Plan Of London 1861 updated with enlarged images. 24 December 2010 Cross's General Map Of Australia 1836 displayed. 23 December 2010 Pigot & Co.'s New Map Of England & Wales, With Part Of Scotland 1840. Including The New Lines Of Canals, Rail Roads, &c. displayed. 15 October 2010 A New & Correct Plan Of All The Houses Destroyed And Damaged By The Fire Which Began In Exchange-Alley, Cornhill, On Friday, March 25th, 1748 displayed. MAPCO Revised: A Plan Of The Great Fire In Bishopsgate Street Leadenhall Street & Cornhill &c. On Thursday Novr 7th 1765. 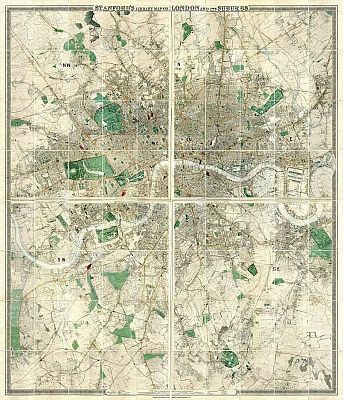 14 October 2010 Kelly & Co.'s map of London 1857: Drawn & Engraved Expressly For The Post Office Directory displayed. 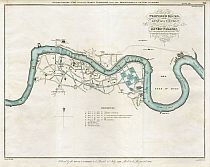 15 May 2010 Date of Smith's New Map Of London revised to c1830. Howgego No. 328 (1). 6 May 2010 Wallis's Plan Of The Cities Of London And Westminster 1804 displayed. 1 May 2010 MAPCO Revised: Cross's New Plan Of London 1850 updated and improved, with its own domain at london1850.com. 1 May 2010 MAPCO Revised: Smith's New Map Of London c1828 updated with enlarged images. 21 April 2010 Plan von Sydney der Hauptstadt der Englischen Colonien in Australien. Aufgenommen von Hrn. Lesueur; und berichtigt von Hrn Boullanger i. J. 1802 (Map of Sydney, the capital of the British colonies in Australia. Recorded by Mr. Lesueur, and corrected by Mr Boullanger AD 1802) displayed. 19 April 2010 Cross's London Guide 1844 displayed. 17 April 2010 Pigot & Co's Metropolitan Guide & Book Of Reference To Every Street In London & Miniature Plan Of London c1820 updated. 11 albumen prints and 12 engraved views of 19th century Adelaide displayed on the new Old Adelaide Photos website, while Adelaide shakes with a magnitude 3.8 earthquake at 11.27pm. 7 March 2010 A Map of the New Roads &c. from Westminster Bridge 1753. 7 February 2010 Complete revision of the London Maps page, with improved layout and information. 30 January 2010 Map Of The County Of Surrey From Trigonometrical Survey With The Roads, Parks & Railways, By James Wyld, Geographer To The Queen, 1874. 19 December 2009 MAPCO Revised: Cross's London Guide 1851 updated and improved, with its own domain at london1851.com. 7 October 2009 Modern Plan Of The City And Environs Of Dublin 1798. 12 July 2009 MAPCO Revised: Part Of Southern Australia From The 132° To 141° Degree Of East Longitude, 1836 updated. 11 July 2009 MAPCO Revised: Plan Of The City Of Adelaide In South Australia With The Acre Allotments Numbered And A Reference To The Names Of The Original Purchasers. Surveyed & Drawn By Colonel Light 1837 updated. 9 July 2009 MAPCO Revised: The District Of Adelaide, South Australia, As Divided Into Country Sections 1839 updated to suite wide website format. 9 July 2009 MAPCO Revised: The District Of Adelaide, South Australia, As Divided Into Country Sections 1840 updated to suite wide website format. 5 July 2009 Map Of The Hundred Of Onkaparinga, South Australia, 1899. 27 June 2009 MAPCO Revised: Ebb And Flow Of War - The Gallipoli Withdrawal 1916 updated to suite new website format. 25 June 2009 Kelly's Post Office Directory Map Of London 1886. Metropolitan Goods Conference. Map Of Collection & Delivery Boundaries. 14 June 2009 The City Of London As In Queen Elizabeth's Time, by John Strype. 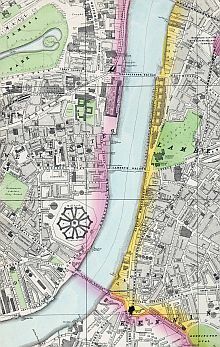 13 June 2009 MAPCO Revised: Wallis's Plan of the Cities of London and Westminster 1801 updated to suite new website format. 19 May 2009 MAPCO Revised: Stanford's Map Of London Showing The Boundaries Of Parishes 1877 updated to suite new website format. 17 May 2009 Cary's General Plan For Explaining The Different Trusts Of The Turnpike Gates In The Vicinity Of The Metropolis 1790. 4 May 2009 Plan of the City of Westminster in the Time of Queen Elizabeth 1593. 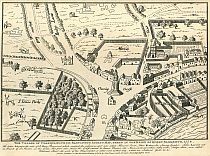 3 May 2009 A Plan of the City and Liberties of London, Shewing the Extent of the Dreadful Conflagration in the Year 1666. 2 May 2009 Plan Of Roman London - Post AD190. 23 April 2009 Lavars's New & Improved Map Of Bristol & Clifton c1863. 17 April 2009 Moule's Environs Of London 1837. 25 March 2009 MAPCO Revised: Whitbread's Map Of London Extending Four Miles Round Charing-Cross 1865 updated. 22 March 2009 MAPCO Revised: Cross's New Plan Of London 1850 updated to suite new website format. 2 March 2009 A Map Of Windsor Forest And Its Vicinity 1823, By Henry Walter. New Edition Revised And Corrected By Alfred E. Harrison 1856. Taken from "The Country Twenty-Five Miles Round London Planned From A Scale Of One Mile To An Inch" by William Faden. 8 February 2009 The Underground Map Of London 1911. 8 February 2009 Bartholomew's Handy Reference Atlas Of London & Suburbs 1908. 27 January 2009 Wyld's New Topographical Map Of The Country In The Vicinity Of London, Describing All The New Improvements, Metropolitan Boroughs And Parish Boundaries c1872. 1 January 2009 Bowles's Reduced New Pocket Plan Of London 1775. 20 October 2008 Darton's Strangers Guide Through The Streets Of London And Westminster. &c., or, A New And Correct Plan Of London And Westminster With The Latest Improvements, 1814. 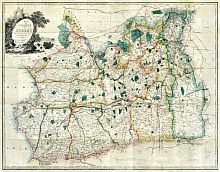 15 October 2008 An Entirely New & Accurate Survey Of The County Of Kent, With Part Of The County Of Essex, 1801. 27 January 2008 Semaphore Pier, Adelaide, South Australia. 18 November 2007 The Aldine History Of South Australia, Illustrated, 1890. 28 October 2007 Plan Of Sydney With Pyrmont 1836. 22 September 2007 Paroisse de Ste. Mary-le-Bone 1829. Plans & Elevations Of The Public Buildings In The Borough Of St. Marylebone. 29 July 2007 Cary's New Plan Of London And Its Vicinity 1837. 27 May 2007 Wyld's Map of Australia c1863. 21 May 2007 Lewis's Map Of Scotland c1840. 11 April 2007 Captain Sweet's Views of Adelaide and South Australia 1866-1885. 9 April 2007 Photographic Views Of Adelaide, South Australia, c1890. 6 April 2007 Album Of Adelaide, Its Suburbs And Botanic Gardens c1885. 5 April 2007 The New Album Of Adelaide Views c1890. 3 April 2007 The Register Street Guide Of Adelaide And Suburbs 1929. 25 March 2007 Gallipoli - Scale 1:20,000, Kurija Dere. 18 March 2007 Wiggs' Views of Adelaide c1899. 15 March 2007 The Gallipoli Peninsula And "The Narrows" 1915. 14 March 2007 Ebb And Flow Of War : The Gallipoli Withdrawal 1916. 13 March 2007 The Daily Telegraph War Map Of The Gallipoli Peninsula 1915. 1 March 2007 Map Of Sydney Harbour And Surrounding Districts 1926. 23 February 2007 Stanford's School Board Map - Westminster 1877. 17 February 2007 Stanford's School Board Map - City Of London 1877. 9 February 2007 Plan Of The Borough Of Hornsey 1925. 4 February 2007 Cross's New Plan Of London 1861. 31 January 2007 Preview Page for the Civil Defence Force South Australia. R.C.C.R. Services Map of Adelaide And Suburbs c1930-1940. 21 January 2007 The District Of Adelaide, South Australia, As Divided Into Country Sections 1840. 6 January 2007 Plan Of The Settlements In New South Wales By C. Grimes Deputy Surveyor-General 1796. 31 December 2006 Topographical Survey Map Of The Borough Of St. Marylebone 1834. 10 December 2006 Frearson's Views of South Australia c1890. 23 November 2006 A Plan Of The Intended New Road From Paddington To Islington, January 1756, taken from The Gentlemans Magazine. 19 November 2006 Preview Page of Lewis's Map of Scotland c1840. 2 November 2006 Groom's New Map Of Middlesex c1883. 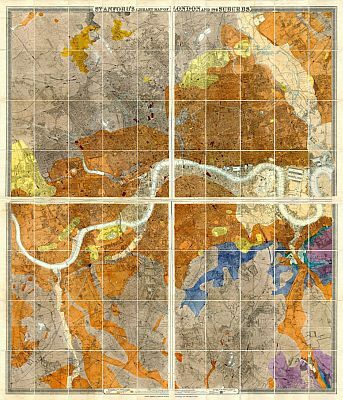 7 October 2006 A Topographical Map Of The Country Twenty Miles Round London 1800 by William Faden. 2 October 2006 Port Adelaide 1839. Taken from "The District Of Adelaide, South Australia, As Divided Into Country Sections" by Colonel Light, Late Surveyor General. Plan Of Section 2112 B, Port Adelaide, 1852. Old Folks Reunion. Town Hall ~ Port Adelaide, Oct 20th 1937. 22 September 2006 Part Of Southern Australia From The 132° To 141° Degree Of East Longitude. 1836. 17 September 2006 Smith's New Map Of London c1828. 30 August 2006 Cary's New And Accurate Plan Of London And Westminster 1795. 17 August 2006 Preview page for an 1915 Gallipoli map showing ANZAC Cove, being the 1:20,000 scale Kurija Dere map (Koja Dere). 1 August 2006 Plan Of The City Of Adelaide In South Australia 1837; With The Acre Allotments Numbered And A Reference To The Names Of The Original Purchasers. Surveyed And Drawn By Colonel Light. 2nd Report Of The Colonization Commissioners For South Australia To Her Majesty's Principal Secretary Of State For The Colonies. 1837. 16 July 2006 Plan Of The East And West India Docks 15th April 1841. 20 June 2006 Smith's New Map Of The County Of Oxford Divided Into Hundreds 1801. 19 June 2006 Panorama Of The River Thames In 1845 Given With The Illustrated London News. Betts's New Map Of Scotland c1847. 6 May 2006 Pigot & Co's Metropolitan Guide & Book Of Reference To Every Street In London & Miniature Plan Of London c1820. An Alphabetical List Of The Streets, Lanes, Passages, Public Buildings And Bankers In The Metropolis, With Reference To Their Situation. 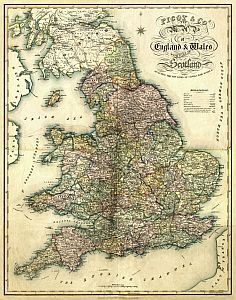 26 April 2006 South-east division of Lewis's Map Of England & Wales c1840. South-west division of Lewis's Map Of England & Wales c1840. 11 April 2006 North-east division of Lewis's Map Of England & Wales c1840. 28 March 2006 Senex's Plan Of The City's Of London, Westminster And Borough Of Southwark; With The New Additional Buildings. Anno, 1720. 21 March 2006 Whitbread's Map Of London Extending Four Miles Round Charing-Cross 1865. 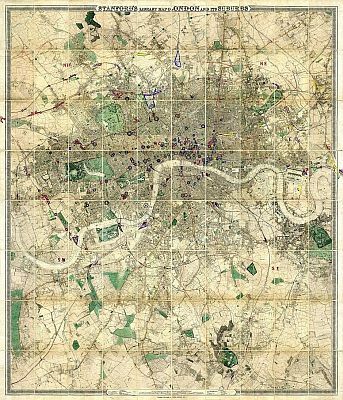 14 March 2006 Stanford's Map Of Central London 1897. 5 March 2006 Wallis's Plan Of The Cities Of London And Westminster 1801. 3 March 2006 Mogg's Strangers Guide To London And Westminster 1834. 25 February 2006 Civitas Londinum : London, Westminster & Southwark In The Reign Of Queen Elizabeth c1560. London From The South Side Of The Thames. Supplement To The Illustrated London News, February 9, 1861. The West-End Railway District 1859. 14 February 2006 Cruchley's New Plan of London Improved to 1827. 11 February 2006 Cross's New Plan Of London 1850 improved. Cross's New Plan Of London 1850. I do hope that you find this site useful and informative. Enjoy!